Here's a little puzzle to get your little grey cells puzzling merrily away this Monday morning. 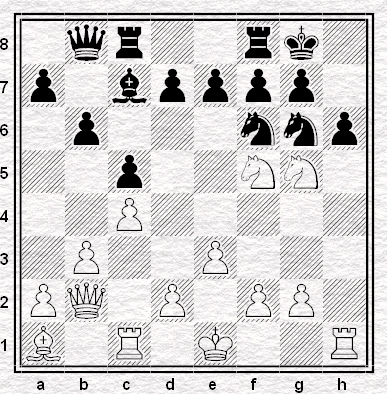 In this position, from an online Chess960 blitz game, it's white to play and, indeed, win. That's not the puzzle though: with five white pieces pointing menacingly at the black king, some kind of breakthrough is obviously on the cards. And indeed, with 11.Rxh6 gxh6? 12.Nxe7+, I forced my opponent's resignation. Instead, the puzzle is how does white win most accurately after 11. Rxh6 Be5! - the most defiant defence? If you want a clue (and an incentive) the !! comes on move 14. And frankly, I'm not sure two exclamation marks are quite enough . . . In this line 14.Ke2 allows Black to complicate with ...Qh2, so maybe 14.f4 first. Of course Black can't capture either the bishop or the rook. And what about 12...fxg6 13.Nxe7+ Kh8. Now White could play 14.Ke2 but 14.0-0-0 is more artistic. Mandarin has it! Very good. With a white rook on c1 how can he play O-O-O? Hi Neill. In Chess960, irrespective of where the king and rook start, the final castled position is the same as in chess. So O-O-O always means Kc1 and Rd1; O-O means Kg1 and Rf1.